Players arrive and are placed into 3v3 or 4v4 games. A) Shieldng: partner up and have players work on shielding that ball from each other. Can start with limited pressure form defender. 3 x 30 seconds each. Last two sets full pressure. Coaching Points: Low center of gravity, shield with arm not back, wide base. Player between ball and defender. - receive and turn with hips open, play on second touch - "turn"
(Optional) - "man-on" lay off and peel off to receive through ball. 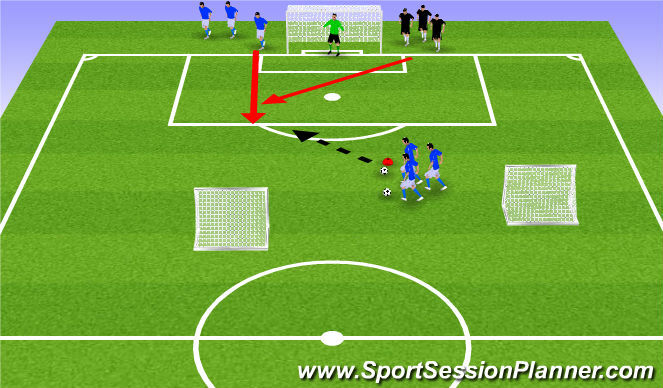 - Attacker (1) checks to player with ball and tries to beat defender (2) by turning them and dribble across the endline. If defender wins it, they can dribble across same endline. As soon as play is dead, now the opposite side works. Keep track of your points. Only points awarded to attacker who successfully turns, beat defender and dribbles across the endline. - This is duel with your back to goal. The Receiving player touches the post, when ready check to the ball on an angle - When she leaves serving player plays it into path of her run; defender from other post comes to defend - 1 vs. 1. 1) If you choose to play the midfielder in, the next defender can go in to make it 2v2. 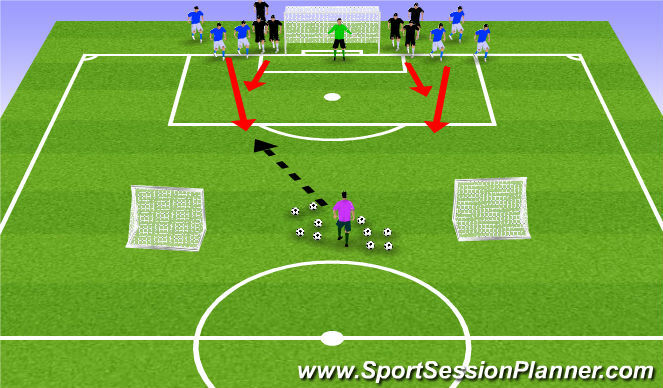 2) Every pass you play the next defender and attacker enter the game. So if you can turn your defender, try and beat them. Switch teams after 4-5 minutes. Make it a competition!!! Losing team does fitness. 1)If defender is checking hard without slowing down, cut it against the grain. 2) Only pass when you have to. If you keep passing, more defender&apos;s come into play.3) If you keep passing in the attacking third, more time for more defenders to come. 4) Use your 1v1 ability to carve and finish. 5) most dangerous player is the one who can be the most successful in this game. 6) Finishing angle is better if you go inside. Two Attackers (blue) check towards coach to receive ball, while two defenders (black) try to win the ball and score on counter goals. Switch roles after 3-4 minutes. Offensive player can use coach to keep possession. -peaking, keeping the ball, using arms to keep the possession, combination play, creativity, movement off the ball. Grid: 20x30 yards for small goals. If you win you move to Queen&apos;s Court or stay there. If ball goes out, first player to go and get it, starts with it. Coaching Points: not many. Compete at a high level.